Rainbows, in my experience, are infrequent, and so everyone would always go crazy whenever they saw one. Rainbows were miraculous things and hard to see, and for the whole time you were looking at it you worried when it would go away. Most important, though, we wondered where the end of it came down and if there really was a pot of gold waiting there. Constable’s rainbow is the first thing you see because it has what rainbows never have, and that’s weight (as heavy as the tree stump or the tower). It distracts from the rest of the painting. 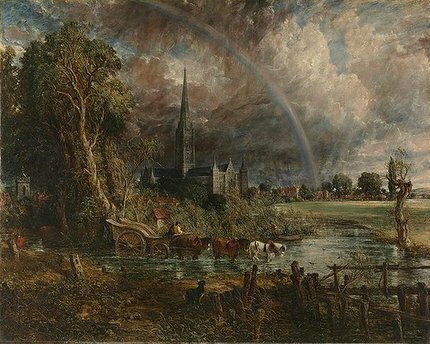 Constable said: “I mean more than the rainbow itself, I mean dewy light and freshness, the departing shower, with the exhilaration of the returning sun.” Even so, when it comes to this painting, Constable criticism cannot sit still. There is an urgency to translate this work into its symbolic meanings: the passing of traditional English rural life, the dangers arising from the emancipation of Catholics, Constable’s grief at the death of his wife, his friendships with the Bishop of Salisbury and his son, the spirituality of Nature, and even the early indications of the rise of abstraction in painting. over there, where there’s lightning? 1. The epigraph above translates as, “Where does the rainbow end / in your soul, or on the horizon?” and is one of 320 questions composing the sequence of 74 poems in Pablo Neruda’s Libro de las preguntas [Book of Questions], completed shortly before his death in 1973. 2. The painting above by John Constable is in the public domain, and the reproduction was downloaded from Wikimedia Commons.